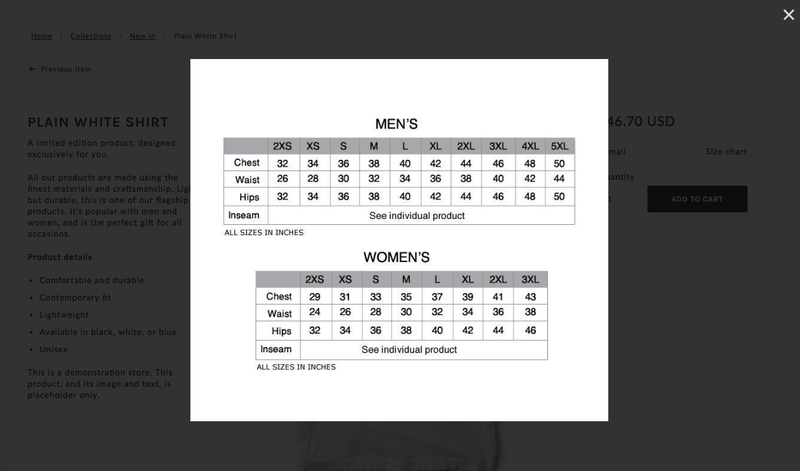 You can add a Size chart to your product page that will show any page's content in a modal. For the Size chart feature to work, your product will have to have at least one variant option to be able to display. On the Product page section settings, add the variant option name in the Link from option setting. You will then have to select in a page to display in the modal. In the example below, we created a new page called Size chart and referenced it in the theme settings. On this page, we added an image of a size chart, but you can add any text or image using the page's text editor. You can change the size chart text to something else in your Languages > Product page tab. Read more about changing default text.